Art takes many different forms so we're doing something a little different for this week's Caturday Art post. We recently received a press release about a grant that was awarded to Sara Pocius of Sea Pony Studio from the Feline Arts Grant Council to produce 100 Cat necklaces for the specific purpose of benefiting the ASPCA. Although many artists competed for the honor, it was Sara’s innovative technique and flowing feline design that won the council over. I love wearing my passion for cats everywhere I go so I was eager to learn more. Sara's unique pieces are created by recreating familiar forms with a continuous line drawing. She then transforms her sketches into stunning flowing jewelry. The Cat is no exception, beautifully designed and created from one ribbon of sterling silver from the top of her tail to the tip of her toe. All of the proceeds made from each Cat necklace will go straight to ASPCA aiming to help provide the animals with a second chance at happy lives. "As an undeniable cat person, it's such an honor to help raise funds for all of the animals rescued by the ASPCA. Designing something beautiful for the humans that also generates love and support for the animals is an amazing feeling," said Pocius. Welcome, Sara! Thank you so much for taking the time to join us today. Please tell us how you became a jewelry designer. Like many jewelry designers, making jewelry was a hobby when I young. I was the girl at summer camp who could knot all the different friendship bracelet designs. And my desire to create actually played out along many more avenues as I grew up. I wrote for the high school newsletter, I dabbled with faux painting walls and furniture, and ultimately pursued a career in Art Direction. I am happiest when my efforts produce an end result that can be seen and experienced! After spending many successful years in the ad agency world creating for major brands, a jewelry making class at the local bead shop rekindled that joy I felt when creating something small and personal. I immediately threw myself into learning as much as I could about the jewelry making process. My journey has taken me through beading, macrame, metalsmithing and ultimately to a place that's the perfect intersection of my computer design skills and jewelry creation. The transition I made from handmade jewelry to my current process was the biggest creative aha! moment I've ever experienced. How is your jewelry created and what makes it unique? My designs always start on paper as a sketch. But instead of moving directly to the materials, they become computer generated vector art and then 3D models. This allows me to create designs that I could never fabricate by hand and the results are truly new and unique. Once my designs have been converted into 3D models, they are either sent off for 3D printing in stainless steel or produced via traditional casting in eco-friendly sterling silver. Both production methods take place here in the United States. The 3D printed pieces have a bit of an industrial vibe and also the fun factor of being created by an amazing technology. While the sterling silver pieces are more classic and appeal to those who like to splurge on eco-luxe jewelry. The coolest thing about these two processes is that the designs are identical, but the final pieces have such a different aesthetic! This process is truly the sweet spot for me as a designer and where I feel most comfortable and creative. How did you become involved with the Feline Arts Council? A friend of mine came across Fresh Step's call for cat creations online. She knew that I would be interested, since I was already working on a cat design I was really excited about. 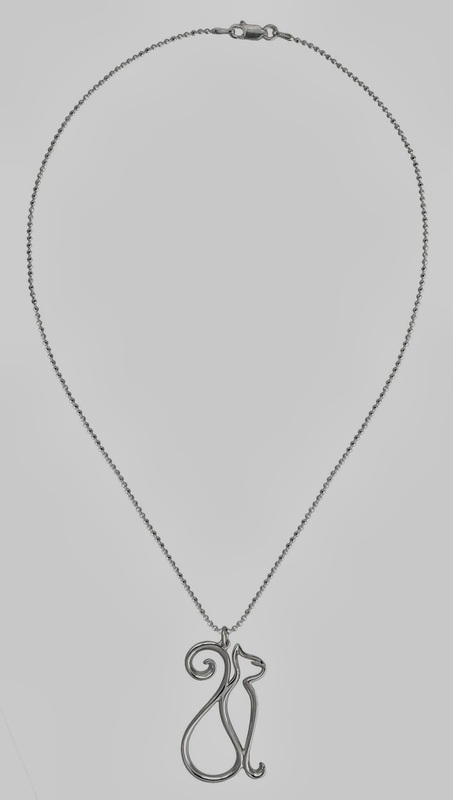 At first I was a bit hesitant to enter since the first design the Council chose was a piece of silver jewelry, but at literally the final hour I submitted by necklace design. Several weeks later I received an email saying my design had been chosen and I was ecstatic. I had to keep it a secret for over 3 months while I worked on production and packaging, so I was very excited to finally announce it publicly in early March. 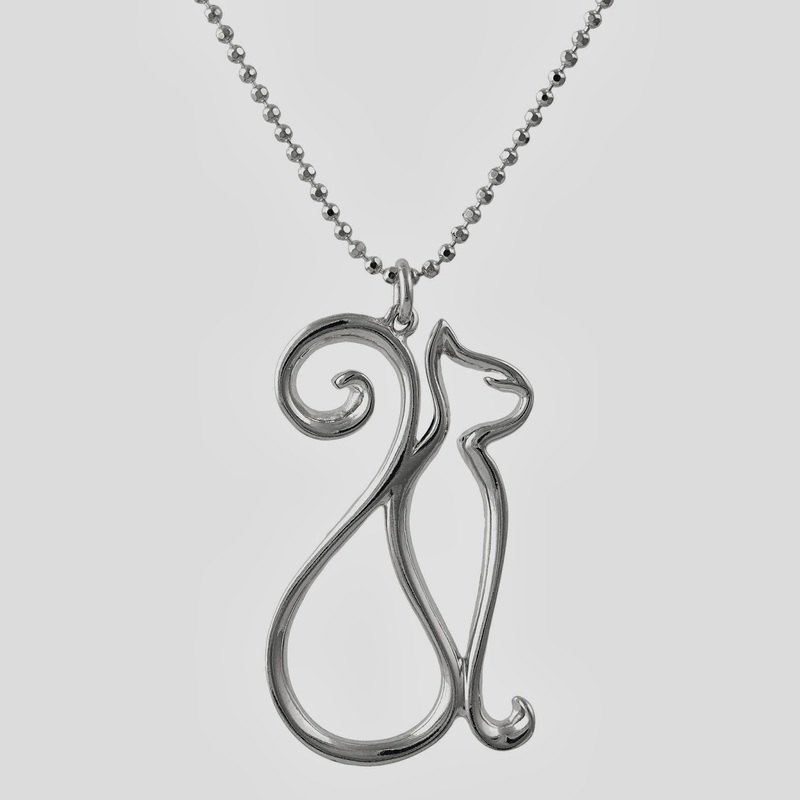 What was the inspiration for your silver cat necklace? My inspiration for this necklace definitely comes from some of the amazingly "catty" female cats I've had the pleasure of knowing. I've lived with cats my entire life and this design reminds me of two in particular. They were beautiful and they knew it! This piece is part of my current collection that originated from the idea of drawing a continuous line sketch that is translated into a ribbon of silver or steel. The bold and graceful silhouette of the cat came so naturally as I sat down to design. I couldn't be happier with the final piece! 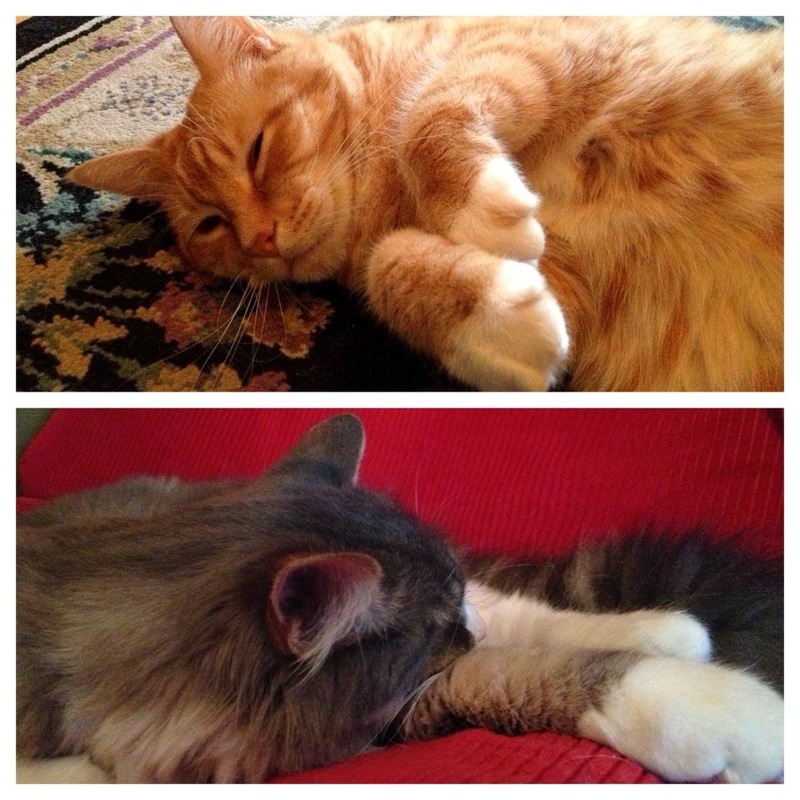 My studio cats are two laid back tom cats, Bill Murray (12) and Tommy Longcat. (3) Both rescues and the center of our household. Bill Murray is an orange Kansas City farm kitty, while fluffy gray Tommy Longcat spent his formative years in the big city of Chicago. But they are both loving my new sunny studio space out in L.A. They enjoy knocking all my supplies around and acting super cute to distract me from getting things in my business done. How can people purchase your grant-winning design? The necklace has such pretty lines. What a stunning design... I love how she was able to capture the exquisite grace of the feline species in such a simple way... Purrs from the Zee and Zoey Gang! That’s pretty. Now that TW is home, she doesn’t wear jewelry when she goes out. This is so pretty!! Thank you for sharing. What a glorious piece of art! Wes loves it. Thanks yous so furry much for sharing it on the Caturday Art Hop! That is a beautiful necklace. And what a great way to support a great cause. How pretty. We had never heard of the feline arts council before. Glad to see that kitty art is being supported. so pretty, and such talent!